Yellen Implies Rates to Rise – That’s Bearish for Gold and for Stocks – Right? And expect to see more flattening of the yield curve as we move thru the first half of 2017, second half is a different story. A flattening yield curve is basically monetary tightening, so that slowly becomes a problem. I will repeat that there is no stock market bubble, long term the market is headed substantially higher, but continue to believe this is a horrible entry point.The big selloffs are great buying opportunities. But a flattening yield curve becomes a problem for financials. The US Bank Index (BKX) is nowhere near it’s 2007 high, even with the tremendous financial de-reg Trump rally. We are continuing to hear about how rising interest rates are bearish for the stock market. But that simple explanation has no evidence behind it. At times stocks do poorly with rising rates, sometimes they do well. And visa versa, sometimes stocks do well with falling rates, sometimes they do horribly. 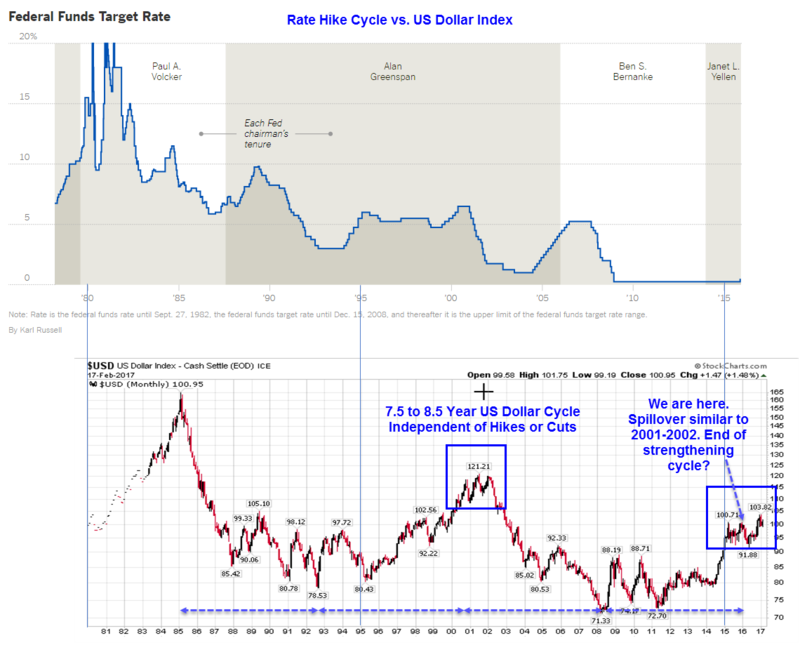 Our most recent examples are: the doubling in the Dow between October 2002 to October 2007 as rates quadrupled; and the Dow falling over 50% into the massive secular low in March 2009 as rates plummeted. And since the 2009 lows in stocks, rates (at the Fed) stayed ultra low, until they started raising rates (way belatedly) in December 2015. But during this time, market-based rates on the short end bottomed in 2011. And stocks have risen for 8 years. So the point is, the correlation between rates and stock prices, in and of itself, is not remotely consistent. It’s monetary conditions (tightening or loosening) which is the key. Rising rates do not necessarily imply tightening, nor does a fall in rates imply loosening. In October 2007-March 2009, rates were falling, yet monetary conditions were tightening. Is that so hard to understand? Apparently if you have an Ivy League PhD it certainly is. Yet for someone who barely made it thru college, it seems pretty straightforward. 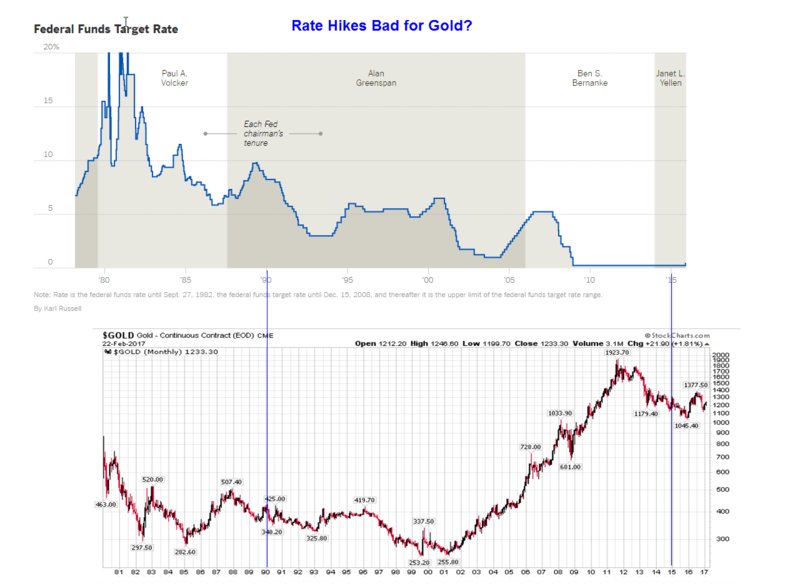 And in December 2015 the esteemed WSJ whiffed again, claiming the Fed rate rise that month was bearish for gold, while my own view was it was finally time to buy gold. Then gold proceeded to hit its’ secular bottom 3 days after the esteemed WSJ article. So once again proving this business is only about working hard and keeping biases at bay. 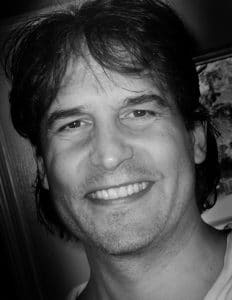 Hey Scott, really enjoy your insight, vid’s, and savvy. It’s not just the FED raising rates but the fact they are always behind the curve which is why it’s a tailwind for the PM’s. We’re into the seasonal timeframe mid March-early June when the PM’s do well in bull markets. Looking forward to your new site. Good point about the seasonals Jon. And the Fed is not only behind the curve, they aren’t even aware of a curve. It’s mind-boggling anyone cares what they say. So we use the hysteria to enter positions, if the setup is there, like yesterday, at a minimum for a trade. Just watching the metals reaction higher when Yellen pretty much guaranteed a March hike is all we need to know. Friday was a good day to buy. Just trying to decide where to put stops for JNUG. Probably not helpful for you Jon, but I have a (mental) stop at my entry 6.04. On Thursday I had to get out of the rest of a NUGT long in premarket, so we’ll see about Monday. Thanks, sounds logical to set a mental stop at entry. I’m also anticipating a Stock market reaction in March-April which should be a catalyst for lower bond yields. Yes and we need to get the first bigger push lower in stocks on very heavy relative volume, and preferably not “news” related. Then it’s the rallies for the opportunities on the other side. My view is that fed really wants to bring the fed fund rate up so that it has more room to cut it when next recession arrives (otherwise it will have to try negative rate). The rally in stocks and the increase of long bond rate, it will be very strange if they do not take of opportunity that the market gives to them. When Mr. Greenspan was the fed chair, he would make speeches or leak something in an attempt to influence or move market (long-term) rate higher. When some Congressmen gave him heat for raising the rate later, he would say that the market already moved up the long term interest rate and the fed was simply following the market. The previous cycle recovery started on November 2001 with much lower debts than today. Sir Print-A-Lot started to raise the rate from 1.25% in June 2003, about 19 months after the recovery and fed stopped it at 5.25% in June 2006. Recession started on December 2007 or 18 months later. Currently we are already in 93rd month of the expansion. With so much imbalance (or mal-investment in the language of Austria school economy) built in economy since June 2009, even though the short term rate is still very low, it probably will not take many 25 basis-point hikes to cause problems later, which is why they waited for a year to make the second move. A very interesting read. Thank you for your input. It is appreciated by me. I thought it was good too – he he. Thanks Tim. Just ignore the clowns – had to learn that the hard way.